This is a guest review by Wilhelm Person. Thanks for reading. This Deluxe edition is the ninth edition of a game first released in 1975 by Ken St Andre as a simpler alternative to D&D, that focused on entertainment rather than simulation. I had to look that bit up on Wikipedia. 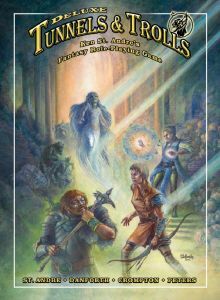 There has been a T&T based CYOA sitting on my shelf for years, but beyond that Tunnels & Trolls hadn’t really registered on my radar as an RPG. When I got the offer to review it for Sophia’s blog I accepted mostly to see what is all was about. These are my impressions based on reading the game. I got the game in PDF format, it is a massive tome (file?) of 386 pages US-letter. It is formatted with two columns per page and quite readable, even on screen. The book is divided into four sections. First the actual game itself of about 160 pages. Then a 60-page section of advanced and alternative rules. 60 pages are devoted to introducing the default setting - Trollworld. The book even includes 40 pages of adventures, one of which is a CYOA style single player affair. Various appendices make up the remainder of the page count. There are loads of really nice black and white retro styled illustrations breaking up the text. The rules are simple, on par with early D&D or most of the current OSR games. Character generation follows the following pattern: Roll 3d6 for the eight stats, with the neat twist that any triple roll, 1-1-1, 2-2-2 etc, are rerolled and added to the initial roll for potentially infinite stats. Select a class from Warrior, Wizard or Rogue (who is something of a mix between the two others). Select a race from Human, Dwarf, Elf, Hobb (hobbit), Fairy or Leprechaun, which gives multipliers for the stats. Fill in a couple of other fields, buy gear and the character is ready for play. Saving throws are made against the stats, and also covers skill use. Stat+2d6 against a difficulty level (doubles are rerolled like the stat rolls during char gen) to succeed. Close combat eschews to-hit rolls, just roll damage directly. Both sides in the combat roll and add up their damage. The party that got the lowest total distributes the difference as they please as taken damage. Ranged attacks involve a saving throw to hit, and if successful the damage goes directly to the target, instead of going into the general pool for distribution. There is a magic system with a whole bunch of different spells that cost Mana to throw. If the cost is paid the spell is successfully cast. Character advancement is done in baby steps with the player spending experience points to raise the stats one step at a time. Simple, right? There’s a bit more to it, some various special cases and so on, but I think you could join a game of T&T with the above summary and do just fine. Plate tectonics had nothing to do with it. The major landforms on Trollworld acquired their current shapes through the efforts of the Great Wizards who entered the world from Elsewhere. Rrr’lff, the Dragon Continent, was formed by Shangingshing-shingingshang, the oldest and greatest of all dragons on Trollworld. And so it goes on for sixty pages. Not very coherent, but loads of curious details and strange places. A treasure trove for anyone looking for inspiration for some whimsical and strange adventures. The setting and rules aren’t heavily coupled, it would be trivial to separate them and use either with other products if desired. The form is traditional, a GM runs adventures for players. However, there’s an interesting twist in that the players are expected to play a couple of characters a piece. With the recommendation of two to five players, that means that a party of around 10 characters that waltz around Trollworld killing monsters and looting their treasures shouldn’t be out of the ordinary. The rules are complete for the genre, and pretty well written. I can see them being used as a drop in replacement for the rules of any OSR game, though stat conversions are a bit more work than usual due to the eight stats and different paradigm of combat system. I get a retro feel from the Trollworld setting. A certain zany everything goes kind of deal. Just reading a couple of paragraphs at random should give me enough material to run a session without much further planning. The form is traditional. There are some guidelines for the prospective GM on what to do when running the game though perhaps not much explanation of how to do those things. There are a couple of ready to run adventures included in the book, for anyone who’d like examples of how the game could be played. The friendly names of spells go well with the overall style of the game (e.g. “Oh go away” and “Poor baby”), but they don’t sound very majestic to me. Perhaps I’m too used to the D&D spell names. The setting is random, but I can definitely work with it. The huge parties of characters seem like an interesting concept. Like an Ars Magica troupe, but everyone goes on adventures together. The text is incredibly verbose. I don’t think I’ve ever seen an RPG that wraps the mechanics in so much text before. To run the game I’d either have to make my own rules summary, or back up a couple of editions to a time when the book was slimmer. To jump in as a player at a con or join an existing game? Yes, sure, it would be nice to see the mechanics in action. P.S. Here is the link again: Deluxe Tunnels & Trolls @DTRPG: PDF, USD $19.95 (affiliate link).